The sine rule is used to find unknown lengths or angles in non right-angled triangles. It is particularly useful when one side and two angles are given, or two sides and one angle are given. In some occasions, using the sine rule directly will give the wrong angle output. 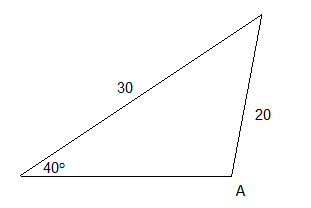 However, it is clear from the image that A is an obtuse angle. The inverse sine function on the calculator only gives the acute angle. 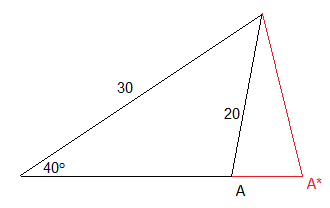 If the angle is obtuse, then subtraction from is necessary in order to obtain the right answer. This ambiguous situation can be illustrated as below where A* = the angle given by the calculator.